JM and Rose Haggar always had a family tradition of giving from their earliest days in Dallas. Their children remember that they always had a saying, “If you take from the pot, you’ve got to put back into the pot!” Starting in the early 1930’s, during the great depression, JM took his three children (Ed, Joe and Rosemary) down to the poor section of West Dallas at Christmas time to help him distribute $5 and $10 gold pieces to the needy people there. (It was before the U.S. got off the gold standard.) This was really the genesis of the Haggar Foundation. JM and Rose continued doing charitable works and making charitable donations all their lives. The Haggar Foundation had its beginning on July 6, 1950, when JM Haggar set aside a certain percentage of the Haggar Company’s profits into the Haggar Foundation and continued this practice every year. The good part about a foundation is that money can accumulate, so grants can be made every year regardless of the profitability of an individual or a company. The Haggar Foundation supported educational and training programs for the disadvantaged and helped the disabled and those in need of healthcare in cities and towns where the Haggar Company had facilities. Over the years many children of the Haggar Company’s employees were able to attend college as a result of the Haggar Foundation. The foundation was a major contributor to the United Fund Drive, St Jude and made significant contributions to the cultural enhancements of Dallas. The Catholic Foundation honored the Haggar Family for their personal and professional contributions and efforts to the Dallas diocese with the McGill Award. Over the years substantial contributions were made to the hospitals in Dallas and local educational institutes in addition to Notre Dame. 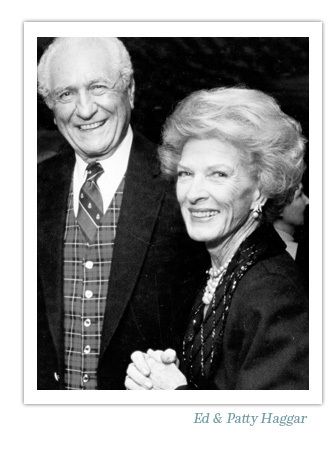 In March 20th, 1995 the Haggar Foundation was split into three individual foundations: The Ed Haggar Family Foundation, The Rosemary Haggar Vaughan Family Foundation and The Joe Haggar Family Foundation. 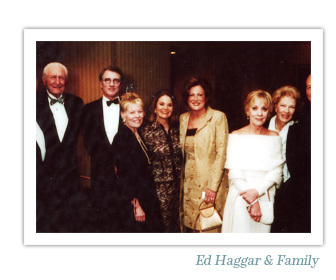 Ed Haggar, Chairman of the Ed Haggar Family Foundation, was widely known for his civic work during his life time. He had been a trustee of the University of Notre Dame, the University of Dallas and the Eisenhower Medical Center in Rancho Mirage, California. Ed Haggar met President Jimmy Carter through his activities with Habitat for Humanity. President Gerald Ford once spent the night at the Haggar home. Ed and Pat Haggar were frequent guests of President George H.W. Bush for private dinners at the White House. 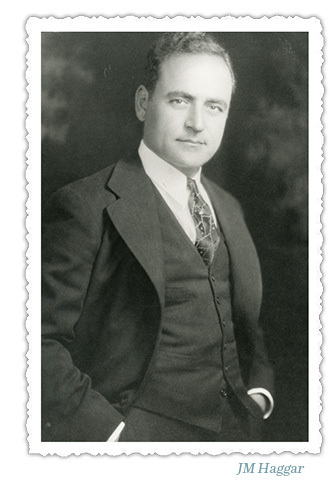 Ed Haggar also served as a national director the Boys and Girls Clubs of America and was a member of the Dallas Citizens Council. Ed Haggar received many awards during his life time including the Notre Dame Man of the Year, Jesuit Man of the Year, Humanitarian award for National Jewish Hospital in Denver, the Herbert Hoover Humanitarian Award from the Boys and Girls Clubs of America and the Edward Fredric Sorin Award, which is given by the University of Notre Dame Alumni Association for Distinguish service to the university. Patty Haggar, wife of Ed Haggar, was a member of the Dallas Women’s Club and Crystal Charity Ball. She was also one of the founders of National Kidney Foundation of North Texas now Kidney Texas, Inc.
Today the Ed Haggar Family Foundation continues the tradition started by JM and Rose Haggar and it has continued thru their children and grandchildren by providing grants for scholarships for Catholic schools, hospitals, healthcare and human services.